Choplifter is a game that should be familiar to anyone who was playing video games in the 80’s. Originally released on the Apple II in 1982, the game later appeared on almost every gaming platform of the era, including the Atari 5200 and Colecovision, as well as home computers including the Atari 8-bit line and the Commodore 64. In fact, my first experience with the Commodore 64 was playing this game at a friend’s house. In 1985, Sega produced a version of this game for their “Sega System 8” arcade hardware. They in turn ported that version of the game to their SC-3000 home computer, the Sega Mark III console, and was part of the North American launch lineup for the Sega Master System. The basic premise of the game is that you as a helicopter pilot must fly into enemy territory under heavy gunfire from other aircraft, tanks, and anti-aircraft guns to land in front of enemy buildings and rescue escaping hostages. You then fly back to your own base to unload said hostages, before flying back for another load. Although it is possible to destroy all of the stationary guns in each level, tanks and planes regenerate endlessly, putting you under constant threat. When you have landed to pick up the hostages, you’re especially vulnerable, as you are basically sitting there helplessly. The difficulty level of the Master System version of this game is brutal, with more and a wider variety of enemies in each stage. It takes a while to get proficient enough with the game to even get passed the first stage, but the addition of new environments in subsequent levels makes it well worth the challenge. While the original game took place solely in the desert, this version of the game features 4 unique environments, each with their own distinct enemies. 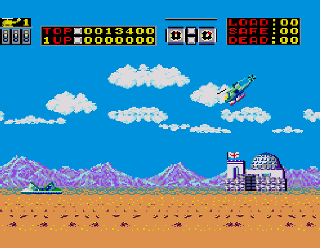 Being released a few years after the home computer versions, this version of Choplifter has noticeably better graphics, which are more detailed and more realistically colored (the sand in the Apple II version was purple.) While the unforgiving difficulty of this game will be a turn off to some, those looking for a new arcade-style challenge will eat this one up. Tagged Arcade, Choplifter, Dan Gorlin, Master System, Review, sega. Bookmark the permalink.